Buying gas cold - Is it worth it? Really? Is that true? Do you really get more gas when it is cold? Because gasoline is a fluid, it is denser when it is cold*. Since we purchase gasoline by volume, there is real science behind this; there will be a difference in volume at different temperatures (after all, this is how hot air balloons work! Heat up air, and it becomes less dense than the surrounding colder air. If you trap this hotter air inside an envelope, through the principle of buoyancy, you can generate lift). *Just about all fluids get denser when they get colder. There is a weird anomaly with water around 4°C, and it’s for this reason that pipes burst when they freeze, and life exists! But does it really make a measurable difference? If we take a gallon of gas at 80°F and cool it down to 20°F, what volume does it now occupy? (But there are a few caveats). Gasoline expands and contracts significantly with temperature changes; far more than water. The magnitude of this volume change is measured by a coefficient of thermal expansion. This is often described by the Greek letter β. A thermal expansion coefficient measures the change in volume (as a ratio) based on a change in temperature. Below is a table for some common fluids. Typical units of this parameter are 10-6/K (how many millionths of the original volume does a fluid change with a change of one Kelvin). As you can see, top of the list is ethyl alcohol. This makes sense now when you remember that liquid bulb thermometers are usually filled with alcohol containing a red dye. A high thermal expansion coefficient helps keep thermometers small and accurate. Gasoline, with a coefficient of 950 changes volume 4.5x greater than water for every degree change. 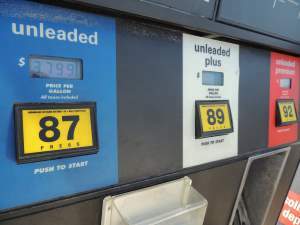 If a gas station owner receives 1,000 gallons of gas when the temperature is 15°C (59°F), and then it is dispensed at a temperature of 4°C (40°F) then, because gas is sold volumetrically, only 990 gallons will be available. This will not please the gas station owner, but the customer will be happier! If you live in a region with high temperature swings, can you use this to your advantage? (If you drive your car in winter, all other things being equal, it means you'll be able to travel a few more miles on a 'full tank', than if you drove the same distance in Summer with a 'full tank'). We've shown that for every 10.5°C temperature lower you pump your gas, you get a 1% increase in volume dispensed, but 1% higher than what? 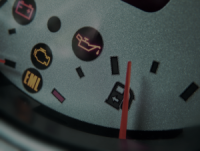 What is the mean setting? At what temperature is the gas pump calibrated? According to the internet (so it has to be true), in the USA gas pumps are calibrated at a reference temperature of 15°C (59°F). If you purchase gasoline at a lower temperature than this, you are getting 'more' for your money, and if you purchase at a higher temperature than this, you are buying 'less' gas for your money. So there you have it, yes, buy when it is colder and you get more gas. It's not the outside temperature that matters when buying the gas, it's the temperature of the gasoline being pumped. Gasoline at service stations is stored in large holding tanks buried underground at the station. These storage tanks are well sealed, and being deep underground, the ground acts as an insulator. The (relatively) rapid weather and daily shifts in surface temperature will have a very slow effect on the temperature deep underground. The high thermal mass of the ground means that the temperature in the storage tank will vary little between the day and night. Even a rapid swing in temperature from a sub freezing morning to a bright sunny afternoon on the surface will have a negligible effect on the temperature many meters underground (The temperature inside caves remains pretty constant throughout the year for the same reasons). So, what this means is that the outside temperature, when you refill your tank, has no impact on the volume of fuel you get. Busted! Hang on though, it's not all over yet. Gas does not stay in an underground storage tank for long! 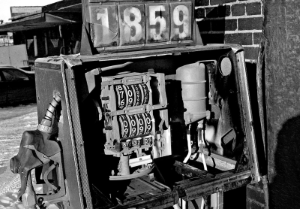 Even a medium sized gas station will sell 10,000-15,000 gallons of gasoline a day. 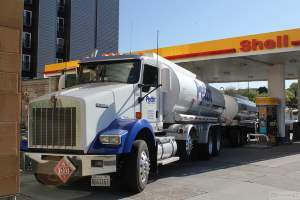 This turnover rate means that a tanker truck will visit an average gas station at least once a day (and for busy stations, maybe multiple times). A tanker truck can hold approximately 8,500 gallons of fuel. The underground storage tanks act like giant insulated Thermos flasks. What this means is that, because of the specific heat capacity of the gasoline, the insulating property of the underground storage, and the short period of time that the gasoline will stay in the underground tank, the temperature of the gasoline will not change much from when it goes in to when it comes out. Ergo, the temperature that gas is typically dispensed to a consumer from a fuel pump is close to the temperature it was at when it was placed in the underground storage from the tanker delivery (Something that you have no control over). This is where my knowledge starts to be get a little thinner and more speculative. 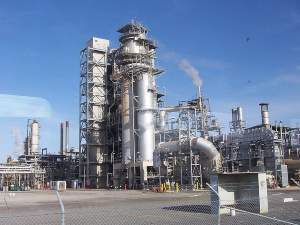 If you live close to a refinery, one could imagine that fuel might be delivered that has been 'freshly made'. Since crude oil is refined using fractional distillation (boiling the crude then extracting off the vapors, with gasoline and diesel coming off at between 150°C-300°C), it's not impossible to imagine that a tanker truck might be filled with product that is still 'warm' from manufacture (and certainly warmer than ambient if the outside temperature is very cold). If that is the case, then maybe it will still be above the 15°C reference temperature that the gas station uses. Thus, if you get your gas from a tank at a busy station you might be purchasing it 'warm' and get slightly less for your money. Conversely, if you live a long way from a refinery then the tanker truck might have had to drive a long way giving chance for the fuel to normalize it's temperature with that of ambient (aided massively by the constant forced convection flow of the air over the tanker truck as it cruises down the freeway at 65mph). So the bottom line appears to be 'it depends'. I guess if you wanted to maximize your chances of getting the best deal on gas, then patronize a small gas station that has a very slow turnover of product, that is a not close to a refinery, and sits on permafrost! Of course, if you have to drive out of your way to visit one of these locations, the detour would vastly outweigh the small mathematical benefit. Whilst temperature does have a very measurable effect on the volume of gas you get, filling up in a morning when the temperature is cold, as opposed to in the middle of a hot afternoon has no practical effect on the volume of gas you're actually getting because, in all but extreme cases, the temperature the gas will be dispenses is not related to the current outside conditions. The temperature that the gas is dispensed is based on things outside of your control (and most likely your ability to exploit). In Canada (and many places in Europe), gas pumps are fitted with automatic temperature compensation devices (ATC). As their name suggests, these devices correct for the temperature of the dispensed fuel and normalize it to a reference temperature so that repeatable volumes are dispensed. (I've heard it described that Canada uses these devices because there is a lower population density, meaning that the turnover of gas in underground storage is much slower, and this combined with the lower temperatures experienced at the more Northern latitudes means that these devices make things fairer). A related, but inverted, problem can occur when fueling aircraft. If you fuel up a plane, the liquid you put in will be either cold, or at least at ambient temperature. If the plane then sits on the tarmac, not immediately departing, the sun can quickly warm the fuel tanks (aircraft skins are typically thin aluminium), causing the fuel to expand. Aircraft designers typically incorporate venting/expansion tanks to deal with this issue, and operators know not to fill up tanks all the way if there is any chance of the aircraft sitting on the ground in warm conditions for any period of time.